So on Saturday I went hacking with our yard groom again. She is allowed to borrow the yard veteran if she is with me (she doesn't have her own horse). We had a nice 4.5 mile trip in the sun. On Sunday I had a lesson with the YO. It was windy so Harvey was his normal mad self to start with and I had to do quite a bit of cantering around before he settled. 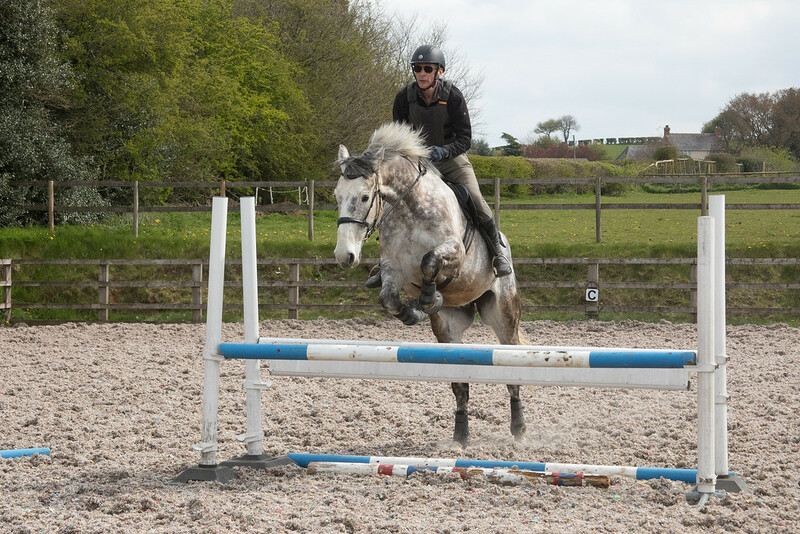 Once he started jumping he concentrated nicely and I'm starting to get some control over where I go now. 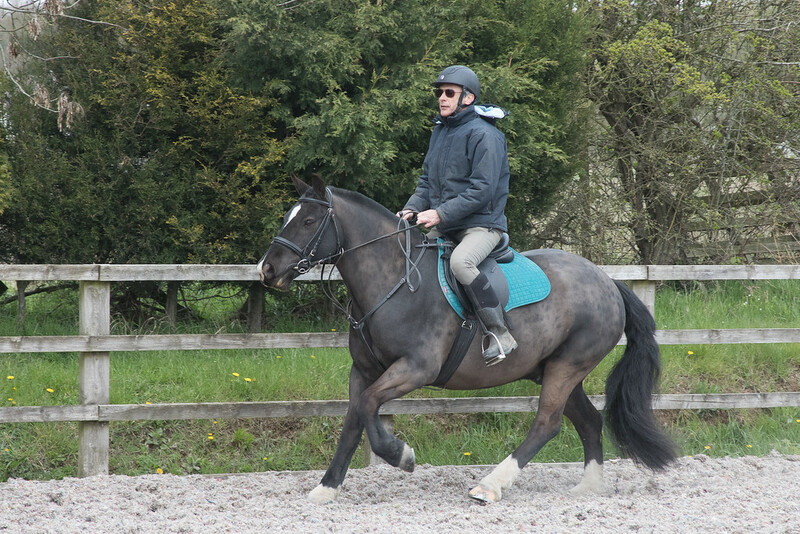 Our latest livery has had her horse a while but is only just starting to learn to ride (i'm not quite sure why!). She is having lessons with the YO and then consolidating in between. She was having trouble cantering so I hoped on just to see if it was her horse being stubborn. He cantered nicely for me, and after that cantered for her. 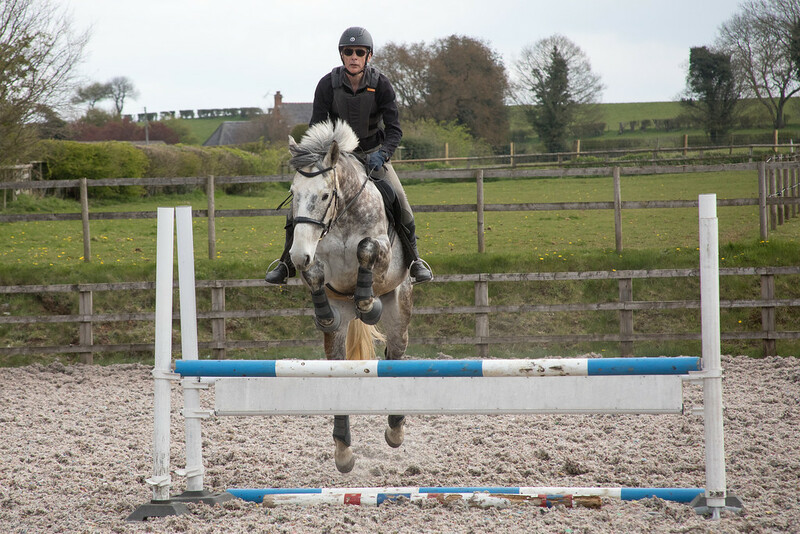 He was then pulling her into the jumps that were set up which she isn't ready for so I hopped back on and jumped a couple of cross poles. 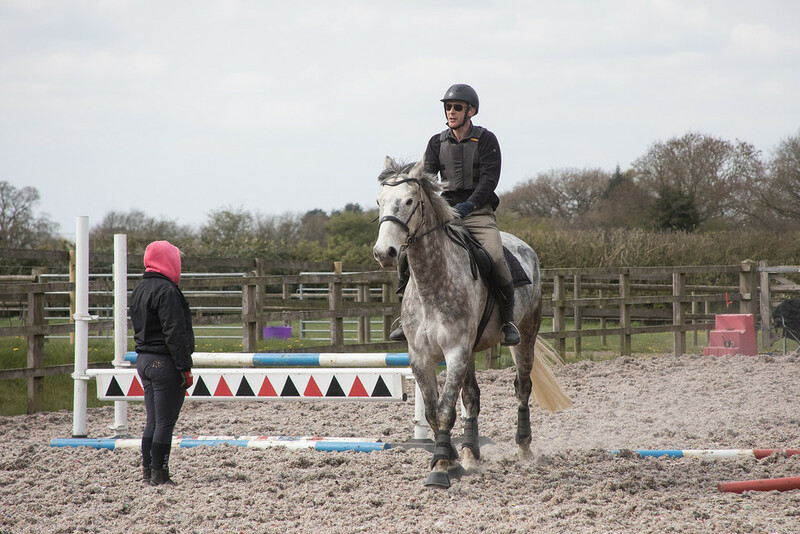 This all caused quite a bit of giggling as I was a bit under horsed, and still riding very short after dropping the stirrups 5 holes. That 90 cm clinic does not seem to be in the cards. You and Harvey look great together. No, 90cm does not look tiny! It would actually come up to my waist! Lol me too I'm 5 foot 1. Look at it this way - we get a much bigger choice of horse sizes! Hogans only 13 h but people think he's quite big when I'm on him! Been busy but riding we now have plasticand wooden jumps on the new yard and now sorting making some country jumps with telegraph poles , pallets and tyres. Had a lovely ride round the field today must have ridden for about an hour. 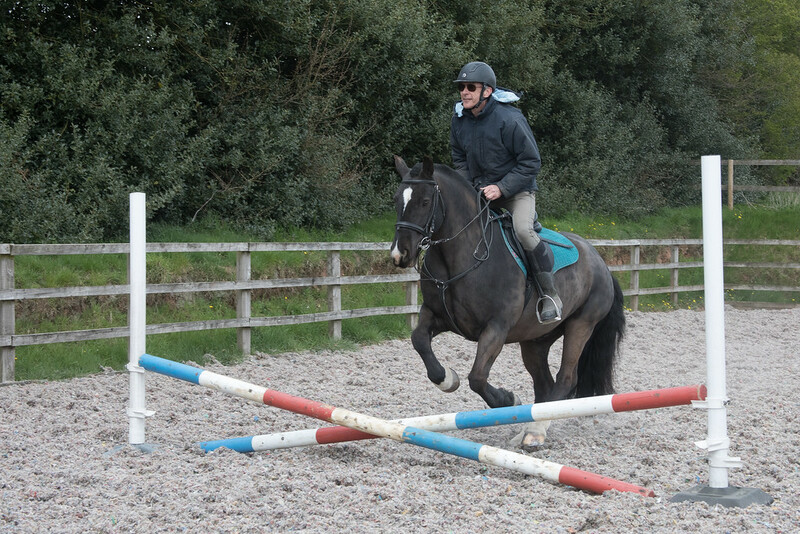 Playing in and out of the jumps.... she will be hacking soon. I have ordered guttering to make a Dressage school 20 by 40 so I can do my first test Having a wonderful time at the new yard. We now have a grass school 20 by 40 for practising our dressage made with plastic white guttering and hoop letters from shires feels so posh lol only been here two weeks and we are almost sorted out. Well, I had a mammoth hack this morning (for me at least) took Belle for a pootle first, to the bluebell woods, beyond the woods is a huge field which we have been riding in and it's great for a quick blast if you fancy one, we tend to stick to walk these days though, anyhow we got there and there are 'woolers' in there with tons of the cutest lambs, were not allowed in any of the field when livestock are in them though, so we had to turn around and go back the way we came, we were only out for about 45 mins but Belle didn't mind, I think now she's starting to feel her age a bit little and often is my mantra. So back to the yard and I had arranged to hack out with a couple of the other liveries who have more lively horses, I borrowed another liveries girly, sweet cob who I may have mentioned before, anyway off we toddled and ended up having a few arguments about who was going to lead the way! Bunch of jessies the lot of them, lol, ohhh scary barn, oooh scary sheep, oooh scary tractor - im not going, oh yes you are, nope Im not, make me, eventually we got passed the scary stuff - I'm so not used to horses having a paddy about stuff any more, it was a bit of a shock to be honest as Belle will go past everything and anything - and had a lovely 90 minutes out in the countryside, can't say I was feeling fresh as a daisy by the time we got back though, in fact Im in need of some deep heat and ibruprofen for my back and some extra padding for my backside! I really can't do un comfy saddles anymore! As always I forgot the photo's - I know I'm useless, but I do have some of the bluebell wood which I'll post once my phone battery is charged again. Sorry guys you can’t really see the bluebells, I’m not a photographer for sure, they look like a blue carpet in real life. Totally lovely ride this morning. We just meandered in the spring sunshine, and chatted to the dog walkers. Got some nice active trots, (believe I may have spotted a muscle in Hogans shoulder! ) Really appreciating riding again. Even with the and a little bit of silly boy I got great halts when I asked. I did not leave him up there for grass since there are some very big trees up there. I let him eat grass in the front yard. Wed was calm and I got great transitons up there and then let him stay and eat some grass. Later that day we did a really long nice play in the small cavaletti pen. I did not do anything either. Toni and I have not caught much of a break on our Tues and Thurs play days. I have managed to do some. BUT tomorrow will be heavy rain all day.